Yesterday I was at a great new club called Hullabaloo. Well, it's not all new since Lee and Sebastian's had it once before at Panora, but now it will happen regularly, I hope. I won't be here to see it through though... Apparently there won't be much happening at Panora at all - it's closed until November! Sebastian had a fantastic northern club there before called Inner City Soul Club, and Marcus (who used to do The Gabb with him) had a garage/beat/psych club called Reaction!. I think he's starting a new club at Retro now instead. Lee, for the ignorant, is in the band Thee Exciters (he also played with us in ASAAR in Stockholm, which was very kind of him). Anyways, they played lots of loud and obscure 60's stuff yesterday as well as some more 50's-ish rock & roll and r & b. Heard a few favourites, like The Sorrows and "What Am I Going to Do" by The Dovers! But the place is a bit strange, it's in the basement to a quite posh restaurant called Brogatan. 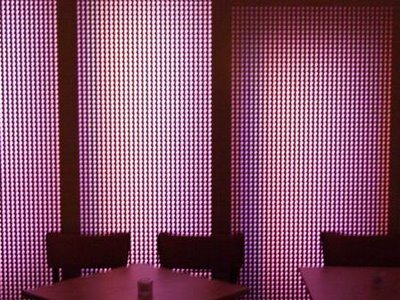 There were chairs and benches with vinyl seats, a wall covered with a metal grille and coloured light behind it - gradually changing from various horrid nuances, and a bar made of the same metal and orange plastic. And let's not go into the pictures you could see through the metal framewok! But it should be ok if only they turn off those lights. I hope there'll be some good sixties clubs in Glasgow too! I'm dj-ing myself next weekend together with Kajsa, when The Lucksmiths visit Lund. The club's called Emma's House and you can expect to hear all my favourite songs whether "you've heard it all before" or if you haven't heard of them at all. And you can expect some 60's gems as well. Just because it's kind of a goodbye to Lund and Sweden and all my friends... I've told them all they're more than welcome to come and visit, so I hope some of you will!